Happy Birthday to me! It’s not the big birthday, but it’s pretty close… almost too close, if you’re asking! I made these last Wednesday, February 16th, in celebration of National Almond Day and they were a huge hit around the office. We’ve been packing things up for a show that we’re headed to, so these were the perfect sweet treat as we took our (many) coffee break(s)! I added in a teaspoon of cinnamon and it totally took the scones over the top. It’s no fun spending your entire birthday in the car, but these nutty scones (along with my Kindle and iPod) make it a little more bearable! Thanks to Mike of Living Out West for this week’s choice – check his blog for the recipe and if you’re in the mood for more Almond Scones, click over to the TWD site for links! Oh yum! Almond is probably my favorite flavor out there! I have to bake scones for an upcoming baby shower and I’ve now found my recipe. Yum, yum, yum. HAPPY BIRTHDAY!! Hope you are having a great day! wow, they look great! My favorite scone of all time is a cinnamon scone at a coffee shop near my old apt in NYC. I bet yours were wonderful! Happy Birthday Jessica! Hope you’re having a splendid day. And thanks for sharing these beautiful scones with us. They look super super delish. Happy birthday! What a lovely way to celebrate! Hope you had a very happy birthday! Cinnamon would be a great addition. Jessica – a very happy birthday to you! Thanks so much for the bake-a-long! I had no idea I missed almond day… sheesh! These look wonderful – the touch of cinnamon is a keeper! Beautiful scones! Happy Birthday to you Jessica! I hope you have the best day ever!! 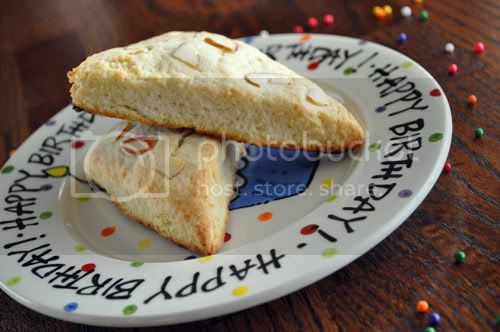 Your scones and that cute Birthday plate are the best!! Happy birthday, Jessica! These scones look so good. I’ve printed out the recipe so that I can make some this weekend! Great idea to add cinnamon! Happy birthday! Happy birthday! 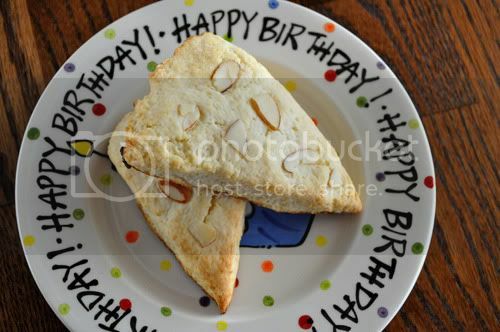 The scones look wonderful and I love your special birthday plate. 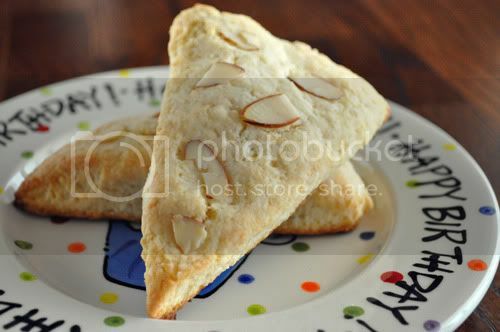 Theese scones look fantastic! And happy birthday.. Happy birthday! I just had one of the big ones, and it actually wasn’t too bad. Milestone birthdays get good presents. =) I love your idea of adding cinnamon to these–I’m not a big almond person, but I love cinnamon. ooh i wish i added cinnamon too! i absolutely LOVE your cupcake birthday plate!! must have one! the addition of cinnamon didn’t even dawn on me, now i’ll have to make these again 😉 your scones look delightul. Jessica, I am so sorry I didn’t see your post yesterday. Happy Belated Birthday!! I hope you had a wonderful day. Your scones turned out perfectly! hope you had a great birthday! these would make for yummy coffe breaks!